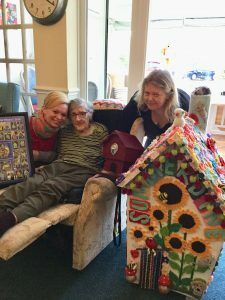 Summerdyne’s Duck House has WON the Duck House Competition for the Bewdley Festival 2018 Community Arts Project. Our residents and staff celebrated the news with the organisers of Bewdley Festival. They presented us with an award and had official photographs taken at our home. 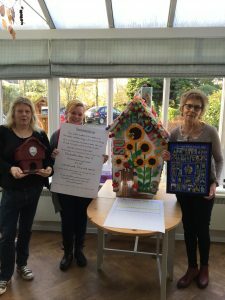 We were also presented with a framed photograph of all the duck houses in the competition and a big card with comments from some voters. We are all absolutely thrilled and a huge thank you to everyone who helped with the project and who voted. 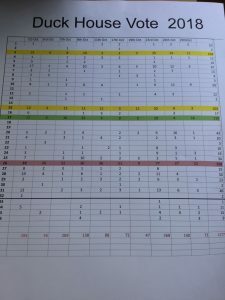 We received 309 votes and second place went to The Greyhound Trust with 119 votes. Over 1000 votes were cast in all. The design of the Duck House reflects our bright and cheerful home. The same love and care that goes into our home, went into the intricate knitting and Duck House design. 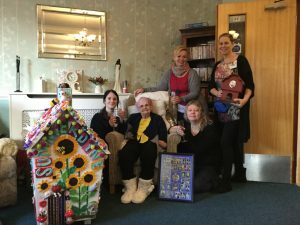 A wonderful team project, with staff, residents and their families all knitting. The Wribbenhall Knit and Natter club, where some of our residents are members, also helped so it had a real community feel. We created the Duck House in our lounge so everyone could be part of its development. 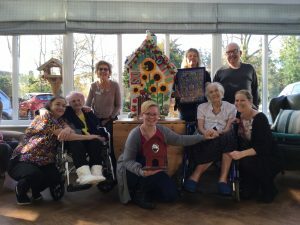 Lovely trips to The Duck Trail with our residents followed, to admire our entry and also all the other fabulous entries. It have been a fantastic community project to be part of and thank you to everyone involved, the voters and organisers.